Answer: Hi, Kruthi. We would need to assess your scalp and level of hair loss to give accurate information regarding your specific situation, but here is some general advice which we hope will help for now. Minoxidil can help to thicken thinner hair growth and possibly shrivelled follicles that are not able to produce hair on their own. Over-processing from chemical hair relaxers among other hairstyling methods is known to be able to damage some of the follicles but it is generally possible to stimulate hair growth provided there is no scarring. Assuming your scalp does not show signs of damage, if you are medically suitable you should be able to start using minoxidil right away. You may need to maintain the application in future to keep this regrowth, though possibly to a lesser extent. You may also need to use nourishing conditioning treatments and have your hair cut as it is likely that you may be experiencing hair breakage as well. This is where the hair becomes brittle and snaps along the shaft, causing the hair to look even thinner, and also it can often have a frizzy appearance. You may find it useful to include some hair growth boosters in your routine. Belgravia’s Hair Vitalics for Women are hair growth supplements that have been specially formulated by our experts to deliver key nutritional support to the follicles. A specialist will be able to advise you as to the best possible hair loss treatment regime for your case and tailor one to your precise needs following a consultation. 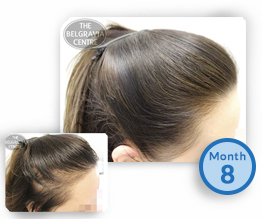 We are assuming you are based in the US or Canada – in the UK ‘Rogaine’ is called ‘Regaine’ – so if you would like to have a consultation with Belgravia’s specialists, you can do so online.